PORTABLE WATER-VAPOR PROOF STRING-LIGHTS 12 VOLT are use for confined space entry apps. Normally attached to scaffolding to create a bright safe working platform for workers. Water-Vapor proof hand lamps are use on these sting lights. These hand lamps are rated for Nema 4x, water proof. This means water will not enter hand lamp from falling water or spraying water as long a hand lamp is hung by its hook. String Lights are not to be hung by their cords. This will void the products warranty and will cause water to enter the wiring compartment of the hand lamps. The term VAPOR proof referencing these hand lamps is related solely to Water Vapor. Not to be used in Classified areas. String Lights are made available in 100′ cord with five hand lamps. Also in 150′ cords with eight hand lamps. Each hand lamp is spaced 10′ apart and has a 3′ cord drop. Both the 100′ and 150′ strings will have what is called trailer cords. This is the length of cord from the last hand lamp on cord to the weather proof plug. 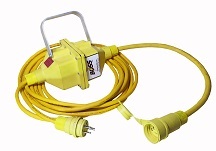 Designed to allow string lights to have extra cord length to reach outside of confined space entry to be plugged into power.